금강반야바라밀경은 줄여서 ‘금강경‘이라고도 불리며 우리나라 조계종의 근본경전이다. 금강석과 같은 지혜로 모든 고통의 고리를 철저하게 끊어야 깨달음의 세계에 도달하게 된다는 내용으로 되어있다. 우리나라에서는 반야심경 다음으로 많이 읽히는 불교경전이다. 이 책은 송나라의 천노가 뜻을 풀이하고 운문 형식의 칭송하는 글을 붙인 것이다. 나무에 새겨서 닥종이에 찍었으며, 크기는 세로 26.6㎝, 가로 15.5㎝이다. 불상 속에서 나온 듯 얼룩진 자국이 있고, 책의 가장자리를 쥐가 갉아먹어 일부 파손되었으나 본문의 보존상태는 양호하다. 책 끝에 있는 이색이 적은 글에 의하면, 고려 우왕 13년(1387) 유구와 강인부가 우왕비에게 청하여 간행한 것이며, 이 판본은 송본(宋本)을 원본으로 하였음을 알 수 있다. Vajracchedika prajnaparamita Sutra (Diamond Sutra) is the basic sutra of the Jogye Order and is one of the most widely read sutras in Korea along with Maha prajnaparamita hridaya Sutra (Heart Sutra). 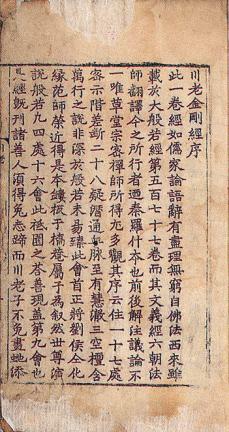 In this book, the sutra was annotated by Chuanlao of the Song Dynasty, and his poetry was added to praise the sutra. 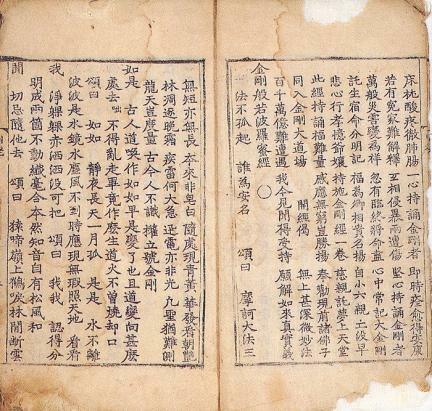 Printed on mulberry paper using woodblocks, the book measures 15.5 cm wide and 26.6 cm long. It has some stained spots, presumably because it was excavated from a Buddhist statue. It has been preserved well even though the corners of the book were partly gnawed by mice. 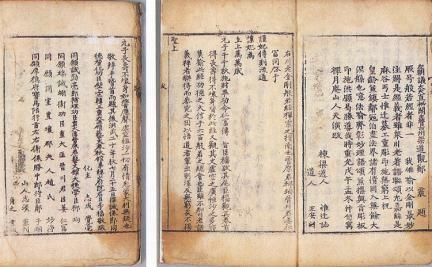 At the end of this book is a record written by Yi Saek, stating that this book was published when Yu Gyu and Kang In-bu made a request to the queen in 1387 (13th year of the reign of King U of the Goryeo Dynasty) based on the original woodblocks imported from the Song Dynasty.